Surf town of Tofino to ban fast food outlets? 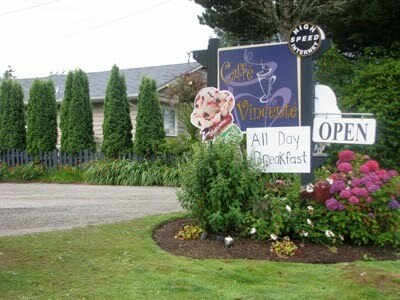 A non-fast food eatery in Tofino. Photo by Sue Frause. Good for Tofino. As somebody who lives in a small town on Whidbey Island, one without any fast food outlets, I'm all for this Vancouver Island community banning big name chains in their surf town. "A councillor in Tofino, B.C., wants to ban fast-food franchises and retail chains from the West Coast surf town in order to preserve its uniquely laid-back character. For the approximately 2,000 residents of the Vancouver Island community, a craving for a Starbucks coffee or a McDonald's hamburger means a drive out of town. That's because there are virtually no chain retailers in the surfing paradise, and District Coun. Stephen Ashton wants it to stay that way." Read the rest of the story from CBC News. I don't know if my hometown of Langley, WA specifically bans fast food outlets, but we do have a Design Review Board that wouldn't allow any of those all too familiar signs. Can you imagine McDonald's or Starbucks setting up shop without their overexposed logos? I was in Tofino this past summer, en route to a Blue Planet Kayaking adventure to Vargas Island. It's a special place, no matter what the season. I like Tofino, and I'll keep returning. Let's hope it remains chain free for both the residents and visitors alike.